Donald Ewer Service Details - Whitby, Ontario | Barnes Memorial Funeral Home Ltd.
Donald Alan Ewer passed away peacefully on Monday October 15th, 2018 at the age of 95. Dear ‘Dad’ of Roddy Turner and his wife Mary-Frances of Aurora, Laura Walker and her husband Greg of Mississauga, Karen Tomarchio and her husband Corrado of Brooklin, and Wendy Turner and her partner Bruce Curtis of Halifax, Nova Scotia. Grandfather figure to Corrie, Susie, Ian, Alex, Robin and Adriana. Predeceased by his brother Derry. Survived by his nephew Nick Ewer (Mary) of England. When he was barely 18 Donald joined the Navy, moving up the ranks to become a Naval Officer with the Royal Navy, surviving a Christmas Day torpedoing during his service. In 1946, following the war, Donald won a scholarship to the Royal Academy of Dramatic Art in London, studying with classmates including such famous names as Robert Shaw. Donald graduated with an Acting Diploma in 1948. Donald worked in London's West End, with repertory companies and with British Radio and Television. After doing a lot of stage work over a six year period in England and Scotland, Donald decided to see the world. He travelled to the U.S. where he spent two months exploring the country, then in 1954 emigrated to Canada. 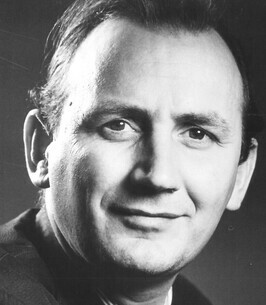 In Canada he directed for Montreal's Lunch Time Theatre, and served as Drama Director of McMaster University. He played major roles with the Crest Theatre as well as Theatre Toronto, and has appeared at the Antioch and the Shaw Festival. He appeared on Broadway in "Alfie" with Terrence Stamp, "Under Millwood," and Off-Broadway in "Billie Liar." Donald made his acting debut at Stratford in 1958 and returned in 1969, performing there for a total of five seasons. In 1970 he won an Obie Award for his performance in"Saved" in the Off-Broadway production at the Chelsea Theatre Centre. Donald became a regular on the Wayne and Shuster Show. He also acted and directed for many seasons at the Walnut Street Theatre in Philadelphia, and had several appearances on the Ed Sullivan Show. National Tours included "Girl in My Soup" with Don Ameche, "The Caretaker" with Barry Morse and "Hadrian VII" with Hume Cronyn. He has numerous film credits to his name including Doolittle in Pygmalion with Peter O'Toole and Margot Kidder, and Spider with Ralph Fiennes. 1n 1987 Donald and his future wife Jenny Turner acted together in the well-known, made-for-TV production of "A Child's Christmas in Wales." Donald and Jenny were married on December 19th, 1990 (Jenny's birthday) and lived happily together in their home in Brooklin Ontario until her death in August of 2013. Donald always said that the key to life was to "keep going, don't stop." He had a great and well-lived life, always the character and ever true to his motto. Visitation at Barnes Memorial Funeral Home, 5295 Thickson Rd. N. Whitby on Saturday October 27th from 10:30-11:30AM, followed by a celebration of life service in the Barnes Chapel. Donald will be laid to rest beside his beloved Jenny at Groveside Cemetery. Messages of condolence and shared memories can be left for the family by visiting barnesmemorialfuneralhome.com (Obituaries, Current Services). Alas, so sad to read of the loss of Donald, who I had been trying to get in touch with for some time now. He and Jenny were wonderful to work with, even more so to have as honored friends. I did THE CARETAKER and 1776 with Donald at Walnut Street Theatre, Philadelphia, shared dressing rooms, what a great man of the theatre and storyteller of same. Joanne and I hosted him a few times in our home, and we will miss both him and Jenny dearly. "Heaven rest you now, Donald!" Love and blessings!